Lathnu HellionAnd Aether ChaserAre both energy cards and I find it is best to go all out with a whole energy deck rather than a few cards. Kari Zev, Skyship RaiderIts a good idea especially since it has a low mana cost. Abrade Is more versatile than Lightning Strike Especially if a opponent plays a strong artefact, however it looses the ability to attack the opponent directly. I agree Firebreathing should go because I never have the mana free to use it, so that's gone. Sengir Vampire was there for his ability to keep getting stronger and cheaper CMC than the dragons, but I'm probably better off removing him and Furnace Whelp for Thunderbreak Regent (which I tend to do when sideboarding) and more removal for the cheaper cards. I do have Blightning and Slaughter Games but I took them out when I was adding creatures. They're probably going back in.The reason I have Archetype of Finality is to give the dragons deathtouch for their abilities that can hit opponent's creatures. Stormblood Berserker also hasn't been that useful but I thought he could be able to protect me earlier with Lightning Bolt and Tormented Soul to get damage in for his Bloodthirst. Are there better lower cost cards I can replace it with? This is very... confusing. Is it two decks, mashed into one? Or 3? What is the cards, you really want to play? I mean, everytime every game? Bump those up to 4. Anything that's more situational, you can remove or put in the sideboard. For example: Archetype of Finality, is that really a good card? 6 mana for a 2/3 body and some text about deathtouch? Do you want to draw this card in every game? 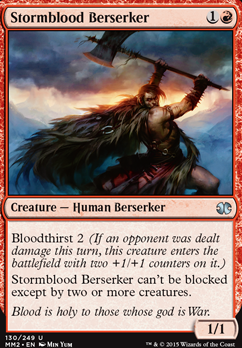 Or Stormblood Berserker - it's a good card, if you play it on turn 2 with bloodthirst, but just a couple of turns later and a 3/3 creature isnt impressive. How often can you both deal a point of damage, and have 2 mana to spare in turn 2? Firebreathing is something many of your cretures have. It's only useful in a deck with piles of surplus mana. How many turns do you end with several untapped lands? Dragonmaster Outcast - how fast can you play 6 lands? And so on and on... you have a lot of dragons, and then a lot of 1-ofs, that perhaps have some kind of synergy. But you'll never see that, because you never draw them at the same time. Also, you need a lot more mana to play those big creatures. You need to pick out a couple of dragons (if you want to play a tribal dragon deck), bump their number up, remove all the clutter (Sengir Vampire - what's that supposed to do here? 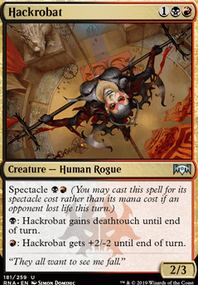 ), and put in some ways to make the game long enough to play big creatures - removal, discard, sweepers, that kind of thing. Giving your opponent 8-10 turns while you play lands is not the way to win. Hi. I'll comment assuming this is not meant to be a standard legal deck. Me and my friend came back to magic in the first innistrad block as a form of gathering again. We established some rules: each one choses a pre-constructed deck from the innistrad block and we could buy 2-3 booster por month and only use those cards to build our decks and we could only trade with each other. That aside, I choose the WR agressive humans deck and my all-star card was (4 copies, of course) Brimstone Volley. If you manage to have tons of humans, then Champion of the Parish is your men. Boros Elite, Wojek Halberdiers, Ash Zealot, Thalia's Lieutenant, Stormblood Berserker, Glory-Bound Initiate, Unruly Mob, Lightning Mauler, Silverblade Paladin, Nearheath Pilgrim. 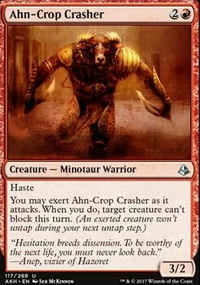 No blocks: Ahn-Crop Crasher is awesome and I see you already listed him. Earthshaker Khenra, Fervent Cathar. 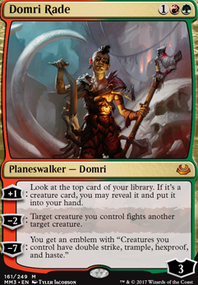 Legion Loyalist, Goblin Guide, Thalia, Guardian of Thraben and Thalia, Heretic Cathar (yeah, I know what you said about budget, but I'm just listing), Bomat Courier, Skyknight Legionnaire is nice (and actually remembers me about the new dude from Ixalan Sky Terror). I love Hellrider, especially if you can get wide. Maybe build around Oketra's Monument? Charging Monstrosaur could be the top end of the deck's curve. 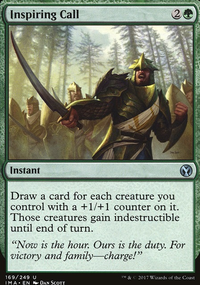 In my deck back in the day, Zealous Conscripts was the top end. Speaking of 5-drops and top end of curve Glorybringer, Urabrask the Hidden, Thundermaw Hellkite and Stormbreath Dragon. Tricks: Boros Charm is ridiculous, it does it all. Unfortunately we stopped playing right after the release of Gatecrash, so I couldn't have Brimstone Volley AND Boros Charm. 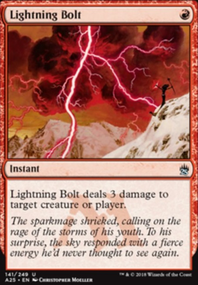 Good old Lightning Bolt. You need to change your mana base cause there are too many taplands. Some Sacred Foundry would be nice, there is Kaladesh's Inspiring Vantage. 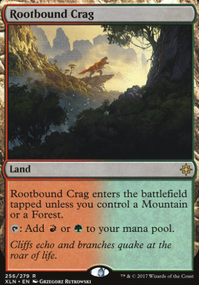 Otherwise I would say to use a few taplands, like 2-3 and get some Evolving Wilds. If the land is going to be tapped, at least Evolving Wilds will thin your deck so you have more chance to draw spells rather than lands. Don't see any reasonable usage of Elixir of Immortality. Could you please explain? P.S. What happened to your deck's description?